The American College of Obstetricians and Gynecologists (ACOG) encourages healthy pregnant women to exercise daily at moderately vigorous intensity, for 30-60 minutes of non-impact, non-contact exercise. While the ACOG recommends physical activity throughout an uncomplicated pregnancy, regardless of exercise history or fitness level, it is absolutely critical that we safely and effectively manage your fitness programs. It is equally critical that you obtain permission from her physician for any and all fitness programs and that all exercise principles (i.e. : SAID, GPO, etc.) be strictly adhered to. Obviously, if all of the above should occur during an exercise session, we should immediately stop the session, contact the clients doctor, and if necessary, call 9-1-1! Athletes in training prior to pregnancy, who would like to continue to maintain the highest level of fitness during pregnancy in order to return to competition post-pregnancy. Recreationally active women who have a moderate to high level of fitness prior to pregnancy and would like to maintain their fitness level during pregnancy and plan to return to pre-pregnant levels of fitness as soon as possible post-delivery. Women for whom exercise is contraindicated. Therefore: No exercise is allowed! Avoiding heated spas, saunas, steam rooms, jacuzzis, etc. Avoiding any exercise activity that increases risk of abdominal trauma (i.e. : contact sports). Low to moderate intensity is preferred to high intensity exercise. Frequency should be a minimum of 3 days/week. Regularity is important (3-7 days/week). Athletes should reduce intensity level as the pregnancy continues. Checking continuously with the doctor since exercise may become contraindicated in the third trimester. Modifying or avoiding activities requiring balance as your shape and center of gravity changes. The center of gravity will move up and forward, making you less stable and more susceptible to loss of balance and falling as pregnancy continues. Pregnancy requires an additional 300 kcal/day. Ensure adequate diet and nutrients. We’ll make sure you add adequate caloric intake to cover exercise expenditure (typically: 200-500 kcal/day). Ensuring heat dissipation with fluid replacement and appropriate clothing and choosing cooler exercise environments (particularly in the first trimester, maternal hyperthermia, as caused by fever during the first trimester, has been associated with neural tube defects. Dehydration can also degrade your thermoregulatory mechanisms.) Ensure adequate fluid intake before, during, and after exercise. Gradually resume your physical activity over the 4-6 weeks following delivery. Some mothers have developed gestational diabetes during pregnancy that normally resolves post-delivery. In non-insulin-dependent (Type 2) gestational diabetes, regular moderate intensity exercise at a frequency of 2-4 days/week at 50% VO2Max (RPE:11), may stimulate glucose uptake and may possibly prevent the need for exogenous insulin (Mothers with Type I gestational diabetes should exercise only with doctors permission and preferably in supervised settings). Exercising throughout pregnancy suggests that you may shorten your second stage of labor, have less weight gain (maternal no effect on baby’s birth weight), improved self-esteem/body image and quality of sleep, reduction of back pain, leg swelling, fatigue and nausea. 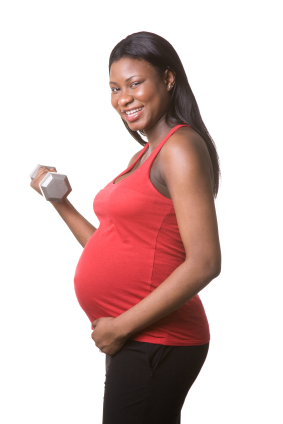 Despite these benefits to exercise it is important to have a clear understanding of the many anatomical and physiological changes that occur to you during pregnancy, including: increased RHR, submaximal HR, cardiac output, changes in heart rate (HR)-VO2 relationship, increased resting and submaximal minute ventilation, maternal weight gain (mainly in the abdominal and pelvic regions), joint laxity and the possibility of gestational diabetes. The influence on exercise capacity and the modifications that must be made to an exercise program as a result of these changes will be the subject of future articles. Get started right now with your new body! Imagine in 8 short weeks you’ll have a new body to awe your friends and delight yourself! Call Phil today at 610-574-3587.